Provide homeowners the confidence necessary to experience their “I can do this!” D.I.Y. moment. 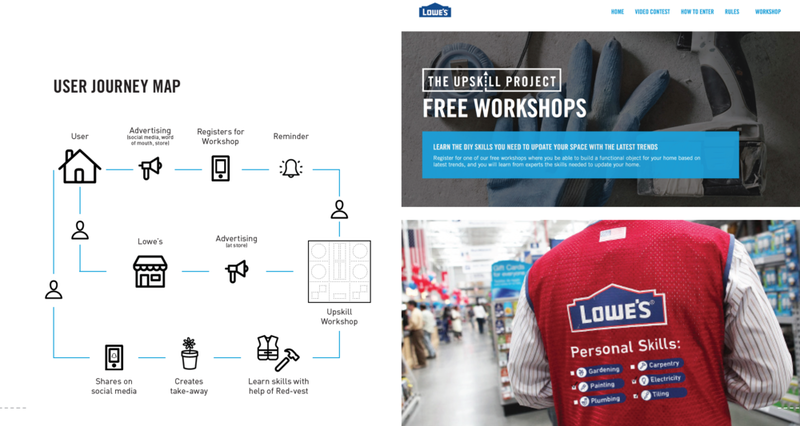 How might we help Lowe’s reach millennials by developing a framework for pop-up events in Lowe’s parking lots that fosters home-improvement skills, creates community, and empowers individuals? For Millennials who are interested in the latest home decor trends and want to update their space with D.I.Y. projects, our D.I.T. service is a social event that provides a safe space and relaxed environment to learn D.I.Y. skills with a hands-on experience and that allows Millennials to create a takeaway piece for their homes. Unlike Home Depot workshops, our service is a full D.I.T. experience that teaches home improvement skills by combining drop-in and drop-off stations, a creative workshop, informational sessions, and inspiration booths, because of our aim to help users love where they live. Our research approach was qualitative. In order to fully understand our areas of research, we did secondary research in some areas that would give us a better understanding of what the mobile experience should be. We focused on understanding what D.I.Y. is, what the different levels of D.I.Y. are, how to empower individuals, community building, pop-up stores, motivating millennials to engage in home improvement, and events that millennials like to attend. We conducted semi-structured interviews in order to gain a better understanding of how people currently perceive and and work towards D.I.Y. projects. We interviewed approximately 20 people including millennials, boy scouts, community volunteers, renters, retired individuals, new homeowners, D.I.Y.ers, and students who live in a residence hall. We selected a diverse group people in order to fully understand how different types of homeownership influence what they want to learn, why they want to learn it, and how inclined they are to learning D.I.Y. skills. Millennials we spoke to said that they have minimal interaction with their neighbors, but they wish there had more. They want to share different projects with the community, share common goals, and help people take care of each other. They perceived high value in things when the bond of trust between the participants allowed them to get and receive feedback. Millennials stress that they don’t have time for D.I.Y. projects. The main motivation and constraint when beginning a project is their budget, so they have to balance time and cost to do it. Accessibility is key. It was a clear pattern that Millennials don’t go to Lowe’s because it is not close to their homes and they found more convenient to reach other suppliers. It is a common pain point for them since they don’t often have opportunity to use a delivery service through the store. It was a project where roles changed accord with the projects necessities. Nonetheless, I played a researcher/strategist/Doer role. Lowe's leverage our findings and suggestions. Lowe's is executing this project across US. "If you don’t talk to your customers, how will you know how to talk to your customers?"